There are many different ways to enjoy nature and the Great Smoky Mountains National Park is one of the best places to unwind and enjoy the great outdoors. Although they might be most famous for their hiking, fishing in the Smokies is a very popular way to enjoy the amazing streams and rivers. As you are sure to get wet and want somewhere to relax in the evenings, plan to stay in one of our cabins in Pigeon Forge and make the most of your experience. 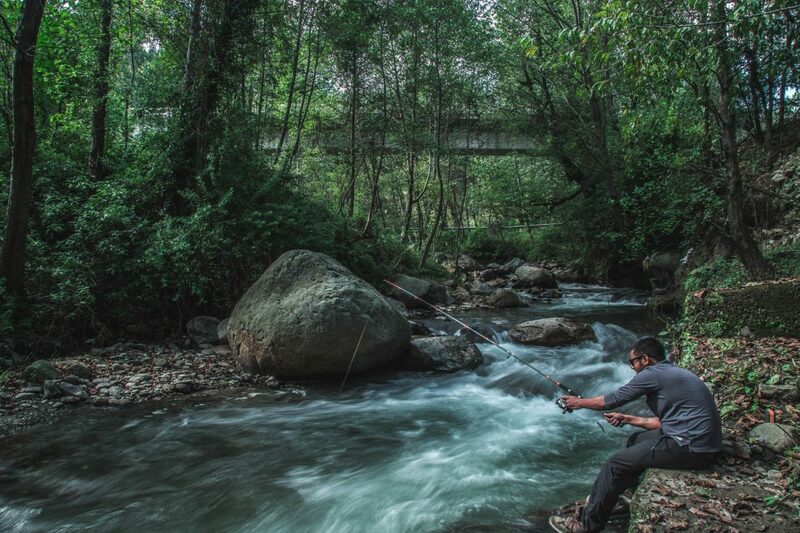 With thousands of miles of streams in the park, there is a good chance you will have a nibble anywhere you put your line, but here are three favorites for fishing in the Smoky Mountains National Park. Easily accessible from Pigeon Forge or Gatlinburg, the Little River is one of the most popular places for fishing in the Smokies. In the summer, the Little River becomes congested with water tubes, but in the early months of the year, you may have a bend in the river to yourself. It offers both wide stretches of glassy water and rocky sections with pools and rivulets so you can try your hand at fishing for rainbow, brook, or brown trout. One of the top destinations for fly fishing in the southeast, Bryson City is home to the recently opened Southern Appalachian Museum of Fly Fishing and has held several fishing events in recent years. Nearby Deep Creek is a great spot to start and, like the Little River on the other side of the Smokies, is easily accessible by road. Its brook trout are larger than average and make it worth the beautiful drive over the mountains. A great spot to bring a beginner, Douglas Lake is rewarding for all skill levels. Home to both largemouth and smallmouth bass, those fishing Douglas Lake may also reel in trout, crappie, and bluegill. There are plenty of sites to help you plan your visit. The National Park has a page devoted to fishing in the Smokies, which includes regulations, limits, and other helpful information. Make sure to buy your fishing license before entering the park as there is nowhere within the Smokies to purchase one. Fortunately, there are no restrictions on which days are open and streams open half an hour before sunrise. After a relaxing day of fishing you will hopefully have a nice catch, but you can hardly bring freshly caught fish to a hotel. Instead, why not stay at one of our cabins in the Smokies? They all feature full kitchens and some even have charcoal grills. Cook up a feast for yourself or the family and then get off your feet and warm up by the fire or relax in the hot tub. Whichever of our cabins or chalets in Gatlinburg that you choose, you will be close to variety of great fishing spots!